Now, I know what you’re going to say: “PG, did you write this just to post that sick .GIF up top?” And the answer is yes (kinda)! But the video that goes with it is great too because it’s a battle between the new Euro Honda Civic Type-R and one of Honda’s fastest bikes. The test comes to us from the UK’s Auto Express. In one corner, the shockingly quick (and shockingly good at sliding!) 306 horsepower Civic Type-R. In the other, the CBR1000RR (not random characters, I promise) Fireblade SP, an insanely fast sportbike. But wait, there’s more! Auto Express didn’t just get some geeks off the street for this test. 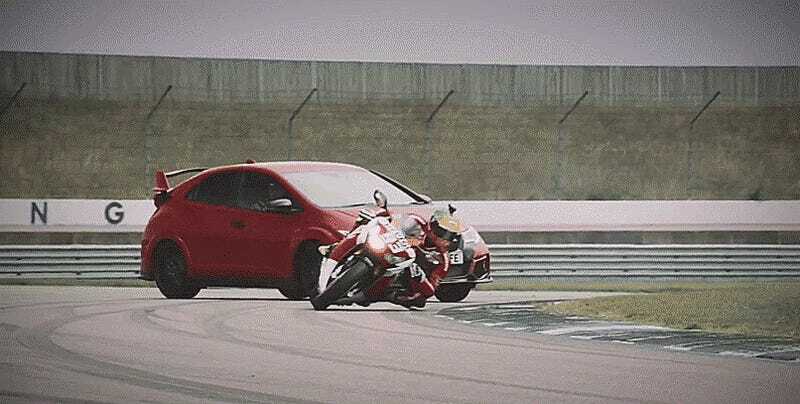 The Civic is driven by Honda’s British Touring Car Championship veteran Matt Neal, and the Fireblade is ridden by Honda’s British Superbike racer Dan Linfoot. Two Honda aces with two very fast Hondas. Who wins? Even with the Civic’s 10-second head start it’s a close one. Bet that test was fun.